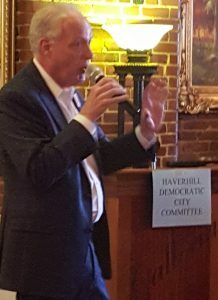 The Haverhill Democratic City Committee (HDCC) supports Democratic candidates and elected officials from local to national levels, works to empower younger people in our party and brings you informative events about political and social issues. Connect with us: Like us on Facebook and follow us on Twitter. Newsletter: How long have you lived in Haverhill? Weren’t you born and raised here? Joe: I’ve lived in Haverhill for most of my life with a couple of detours to New Hampshire and Maine as my wife’s career in education required us to relocate. I was born in the old Hale Hospital – older Haverhill residents might recall it – and raised in the Bradford section of the city on Abbott Street and Hoyt Road. Haverhill was and is a great place to raise children. My crazy parents had eight children. My four brothers and three sisters have all done well thanks in part to our upbringing in this city. Newsletter: I’m sure that most people know you; what are some of the local events, campaigns, etc. you’ve been involved in over the last few years? Joe: I’ve volunteered on too many campaigns to list or even remember. My earliest campaigns were Sharon Pollard and later Marjorie Goudreault – both for state senate. More recently, I’ve worked for national, state, and municipal elections. My favorites include Elizabeth Warren’s first campaign and both of my wife’s [Gail Sullivan, School Committee] campaigns, of course. Newsletter: What are your goals for the Events Committee for the coming year? For 2020? Joe: Goals for 2019 have been set by our committee. Our small but committed group committee members is planning a clean-up event for Earth Day, a cookout in June, a breakfast event in late summer, and an event connected to the presidential campaign in the fall. Future events are possible, but it’s up to our volunteers. If you have an idea, join our committee and work to make it happen. Newsletter: Do you have any events in the planning stages that you haven’t announced yet? Newsletter: Thank you for your time, Joe! 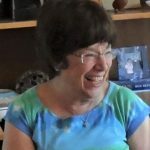 Events Committee: Earth Day Cleanup rescheduled to April 27: go to haverhillrec.com to sign up. Bring rakes and gloves and meet at the Citizens Center, 20 Welcome Street — bring rakes and gloves. HDCC Action/Outreach Committee will meet on April 30th, 6:30-8:30, in the Milhendler Room of the Haverhill Library. The agenda of the meeting is to develop the focus for the website update. Please RSVP to [email protected]. Some suggestions below made by Judy Mathews will be discussed and all others that participants bring to the table. 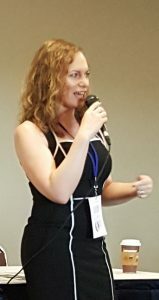 Why should anyone join and/or participate in a City Committee? What audience are we trying to reach with the website? The Everglades was once reviled as a liquid wasteland, and Americans dreamed of draining it. Now it is revered as a national treasure, and Americans have launched the largest environmental project in history to try to save it. The Swamp is the stunning story of the destruction and possible resurrection of the Everglades, the saga of man’s abuse of nature in southern Florida and his unprecedented efforts to make amends. Bill recommends this book because it stresses the environmental connections and how easy it is to destroy things. Readers, again a plea for you to help us out! What are you reading? Why do you think everyone else should read it too? Whether it’s the perfect romance novel (we all need to escape!) or socially relevant nonfiction, let us know why the book is important to you and link to the book’s Amazon site. Send Book Nook features to [email protected]. Please use the subject line Book Nook. April 27, 2019, 8:30 a.m. – 1 p.m., join HDCC Events Committee at the Citizen’s Center for our Earth Day cleanup project. There are tasks for everyone to do no matter age or ability. Go to haverhillrec.com to sign up. 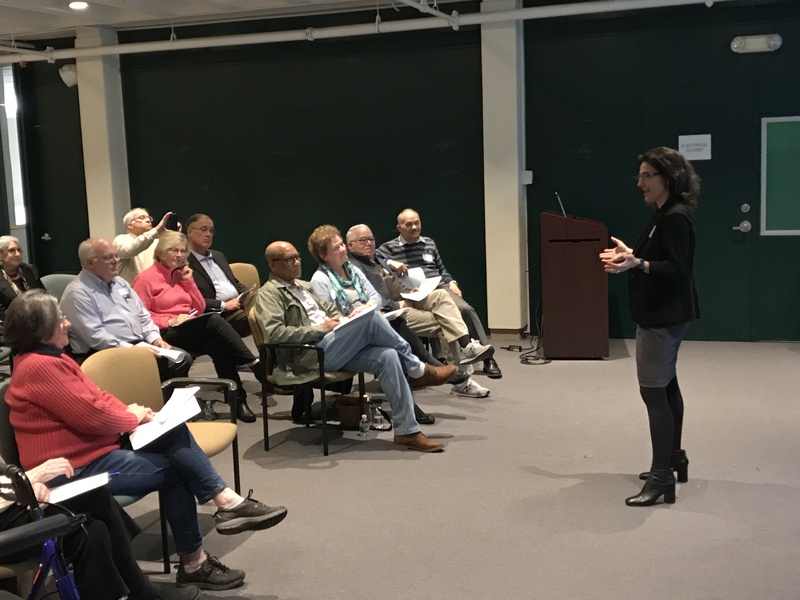 May 20, 2019, 6:30 p.m., Ward Committees 1 – 7 Caucus to elect delegates to the 2019 MA Democratic State Convention. Haverhill Public Library’s Johnson Auditorium. You must be a registered Democrat to be elected. As long as a person is 16 years old or older on May 11 and is a registered or pre-registered Democrat as of the day of the Caucus, the person can participate in a local Caucus. There will be a short meeting preceding the Caucus. June 2019: Summer Kickoff Cookout. Join us for an afternoon of excellent company, good food, and fun at Winnekinni Castle. Tentative plans include our local legislators working the grills. Stay tuned for details. September 7, 2019, HDCC Annual Breakfast, details to come. September 14, 2019, Democratic State Convention, details to come. Look at what our elected representatives are up to! Thank them, nag them, beg them — tell them how you feel! Until you have them on speed dial, find all of your representatives — state, local, and national — here! 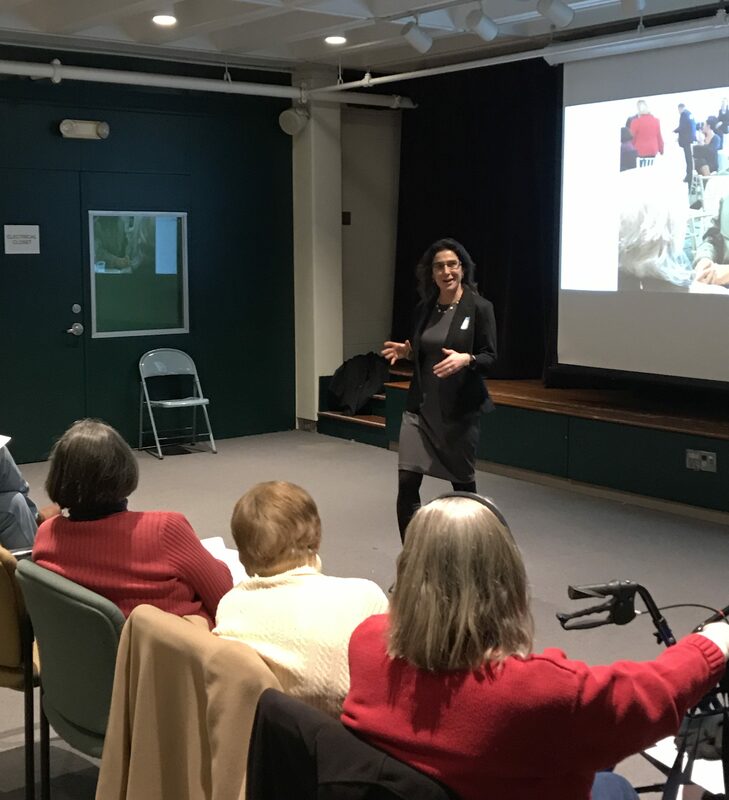 The Action/Outreach Committee is planning its first meeting of 2019 on April 11, at 6:30 p.m., in the Haverhill Public Library Auditorium. The 2019 agenda is an exciting and challenging one: to increase voter participation, to increase the active membership of the HDCC, and to increase participation by young people and diverse people. Low voter turnout and interest. Although the 2018 midterm election turnout was uncharacteristically high, most midterm and local elections see very low voter turnout. Lack of young people and diversity in HDCC membership. The need to increase the HDCC pool of active members. Because committee goals this year involved reaching out to the community to increase membership and voter participation, the Action Committee has become for 2019 the Action/Outreach Committee. Some ideas for increasing voter participation are to contact nonvoters and invite them to a “focus group”/potluck event (something fun), where committee members can find out some reasons for why they don’t vote. It might be lack of time or the need for childcare, or perhaps they don’t see the relevance or politics to their lives or the point of voting. What would change their minds? 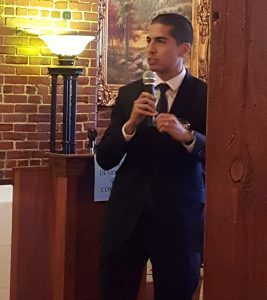 Ideas for increasing young people and diversity in HDCC membership is to reach out to some of the MA3 candidates, who had a contingent of young supporters (Why did they join those campaigns? What excited them about their candidate? ); to reach out to any political groups at Northern Essex and the High School; and to reach out to young and diverse people through the women’s movement. Vary the meeting times between evenings and weekend afternoons. Establish a ride share or carpool for night meetings. Increase social media presence so members can be invited to HDCC events with Facebook invites; increase links between Facebook and website. Offer training in social media, texting and Hubdialing voters, and canvassing for candidates. Offer HDCC carpools to protest marches. Set up an environmental/climate change subgroup. As you can see, the Action/Outreach Committee has an ambitious agenda for 2019 to prepare for election year 2020. All are welcome; contact [email protected] for more information. The HDCC Events Committee has its next meeting on April 4 at 7 p.m. Please contact Joe LeBlanc ([email protected]) for location and to RSVP. 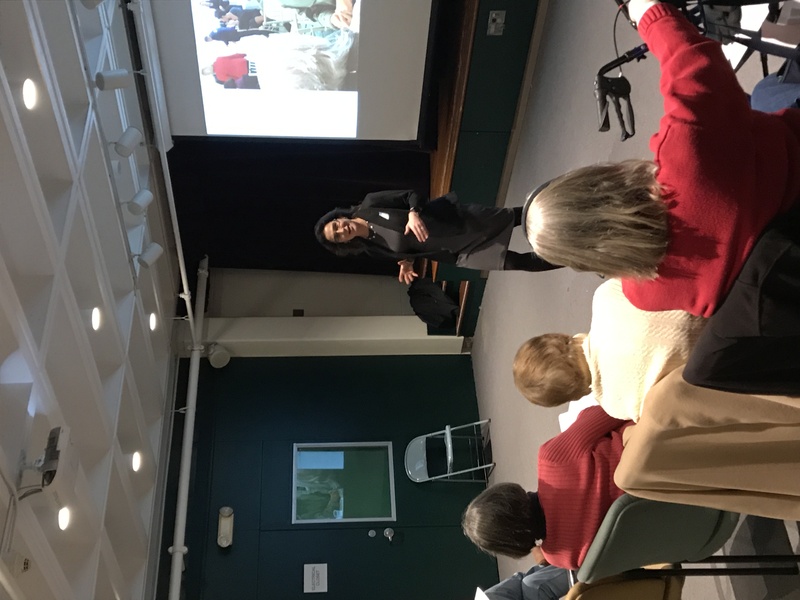 As noted above, the HDCC Action/Outreach Committee will hold its first meeting of 2019 on April 11, 6:30 p.m., Haverhill Public Library Johnson Auditorium. Referring to the defensive moves that white people make when challenged racially, white fragility is characterized by emotions such as anger, fear, and guilt, and by behaviors including argumentation and silence. These behaviors, in turn, function to reinstate white racial equilibrium and prevent any meaningful cross-racial dialogue. In this in-depth exploration, DiAngelo examines how white fragility develops, how it protects racial inequality, and what we can do to engage more constructively. This is an eye-opening book — I encourage everyone to read it. At all levels of government, we have work to do. April 4, 2019, 7 p.m., Events Committee meeting; please contact Joe LeBlanc ([email protected]) for details. 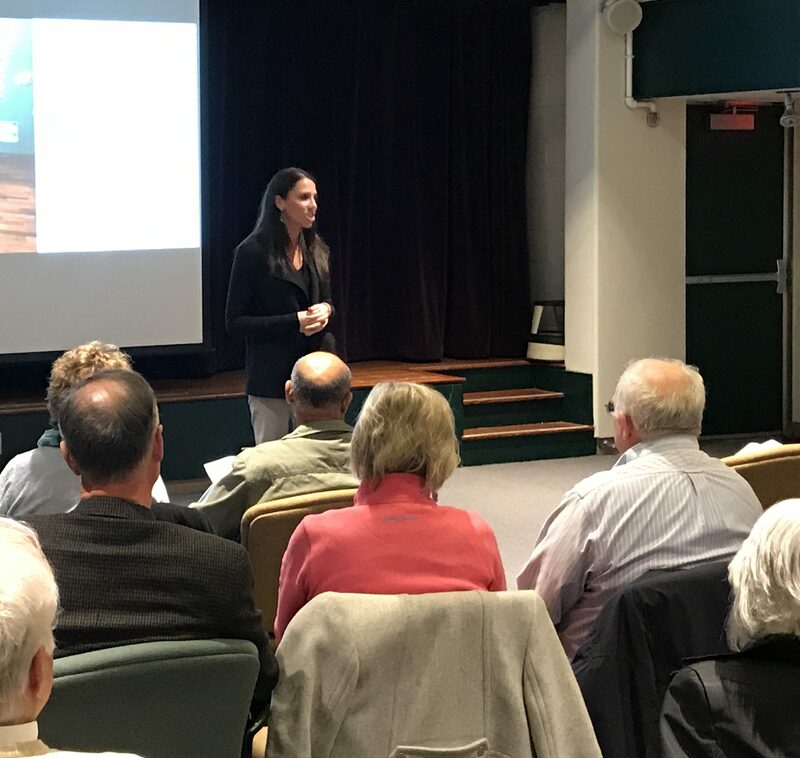 April 11, 2019, 6:30 p.m., Action/Outreach Committee meeting, Haverhill Public Library Johnson Auditorium; please contact [email protected] for details and see the article above for agenda and 2019 goals. April 20, 2019, 8:30 a.m. – 1 p.m., join HDCC Events Committee at the Citizen’s Center for our Earth Day cleanup project. There are tasks for everyone to do no matter age or ability. Many thanks to Rosemary Young, Bill Cox, Joe LeBlanc, and Roz McKeon who wrote the newsletter this week. Breaking News! Senator Elizabeth Warren announces her candidacy for president of the United States! Watch it here. Note that this is a video of the whole 2-hour plus event, and the link takes you to Warren’s entrance; scroll back in time if you want to see Rep. Joe Kennedy’s great introduction or any other of the inspiring speakers, including Senator Ed Markey and Rep. Lori Trahan. 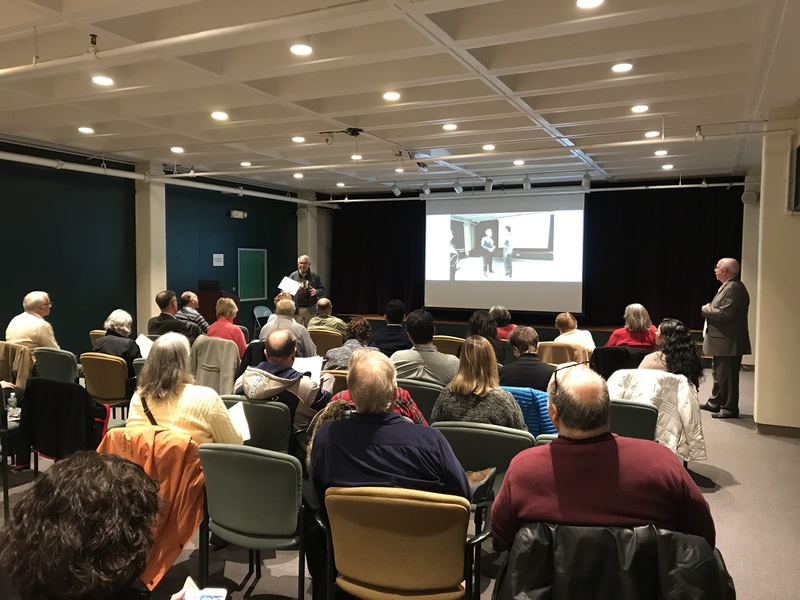 More than 50 people attended the HDCC’s 2019 Kickoff at the Haverhill Public Library’s Johnson Auditorium on February 4, according to HDCC chair Bill Cox. 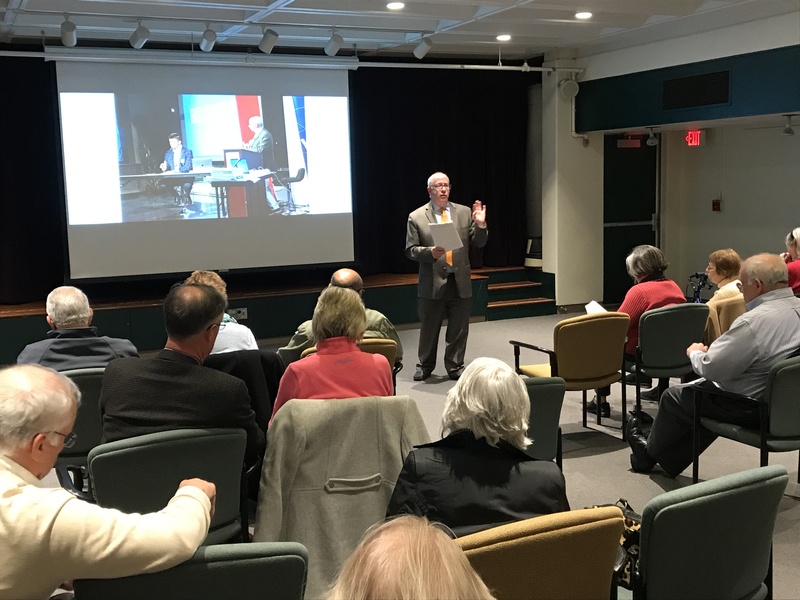 A slideshow of the HDCC’s many accomplishments from 2016 through 2018 played throughout in the background, courtesy of Bob Young. The slideshow below shows some of the participants in the Kick Off. Many young persons attended, including many of the Chief of Staffs to our representatives, and they helped energize the meeting. We were happy to get a few new members of the HDCC! After a brief social hour, Bill Cox reported on the budget, and members heard from the Latino coalition, which was formed from our Immigration subcommittee, noted Bill Cox. 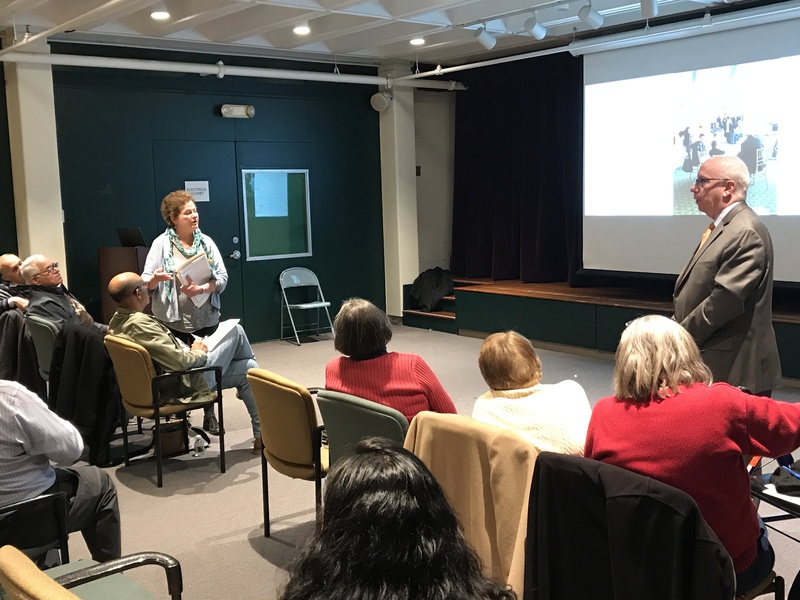 Ismael Matias summarized the successful meetings with U.S. Representative Lori Trahan and Mayor Jim Fiorentini; he also spoke about the priorities of the Haverhill Immigration Coalition. There will be a follow-up meeting with the Haverhill School Superintendent; details to come. People recommended that the Newsletter include some information translated into Spanish. Members filled out a questionnaire to determine HDCC priorities for 2019. This survey is available online for people who were not able to attend Monday night (survey takes about 5 minutes to complete). Haverhill’s House and Senate state delegation was on hand to talk about their priorities for 2019. 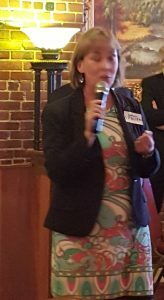 Representative Linda Dean Campbell’s priorities are funding for education, health, prescriptions costs, and environmental issues. Representative Christina Minicucci has spent much time on gas line safety because of the Columbia gas explosions in her district. 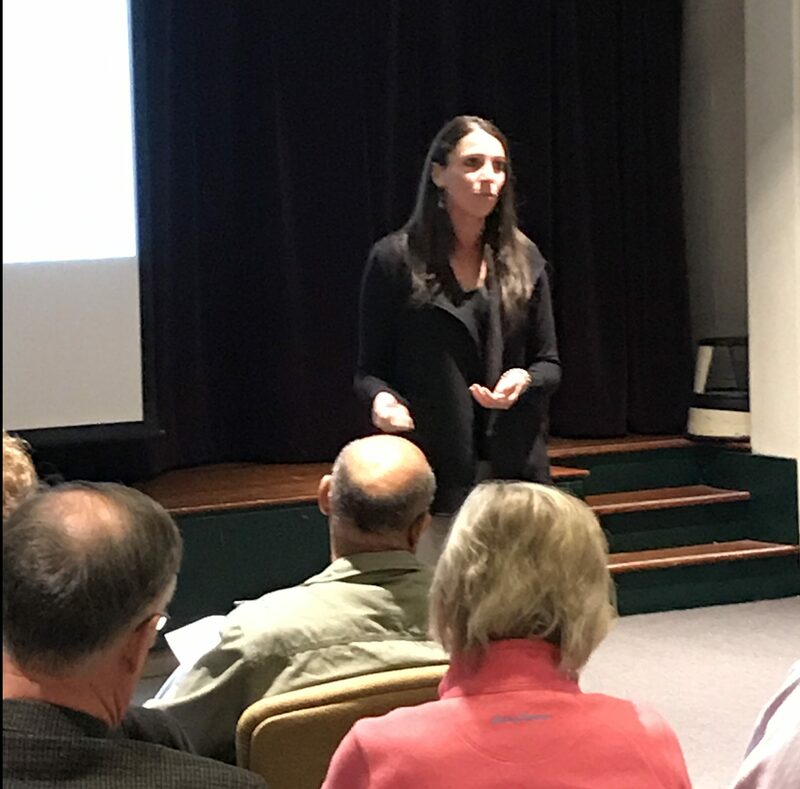 Senator Diana DiZoglio’s main emphasis has been passing the Senate Rules Package for nondisclosure agreements, which successfully passed the Senate but not the House. 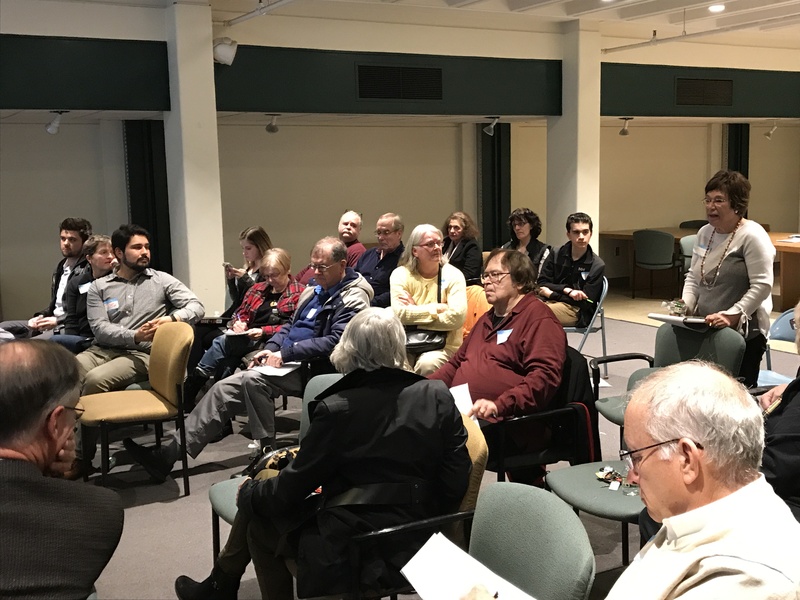 “The HDCC event provided members an excellent opportunity to hear from their local Democratic legislators as well as to organize for 2019 in what looks to be an exciting year,” said Joe LeBlanc. Then we had a lively discussion about HDCC activities last year — what worked and what we might want to do differently. 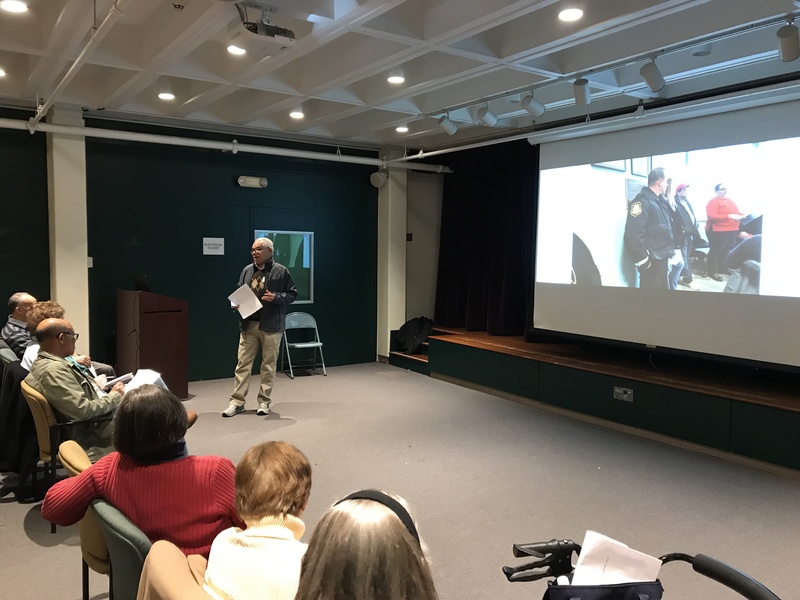 Members discussed successes from 2016 to 2018, and then offered suggestions for 2019 including having a permanent HDCC office where people can meet and work on special activities. Increase HDCC member participation by having more social events. Create a permanent liaison with our State representatives and senator. Socialization continued. “Wonderful upbeat and informative meeting!” said Roz McKeon. It was the first time that Library employees came up to tell us it was time to go. A good sign of a successful event! What would happen if the president of the U.S.A. went stark-raving mad?” Back by popular demand, The New York Times calls the 1965 bestselling political thriller by the author of Seven Days in May, “A little too plausible for comfort.” How can one man convince the highest powers in Washington that the President of the United States is dangerously unstable—before it’s too late? Read more and buy the paperback here. Action Items: will return soon! Look for committee meetings to be organizing soon! After an extended winter break, the Newsletter is back, and the HDCC is ready for 2019 — full steam ahead. Democrats have the House, we have a new Congresswoman, and the Trump Shutdown is over. Monday, February 4, 2019, 6:30 p.m.
As befitting all celebrations, we are starting with a social hour — please bring a friend and — if you can — a treat to share (cookies, cheese and crackers, etc.). Our state legislative delegation — State Senator Diane DiZoglio and State Reps. Linda Dean Campbell, Andy Vargas, and Christina Minicucci — are invited to mingle and then later speak. 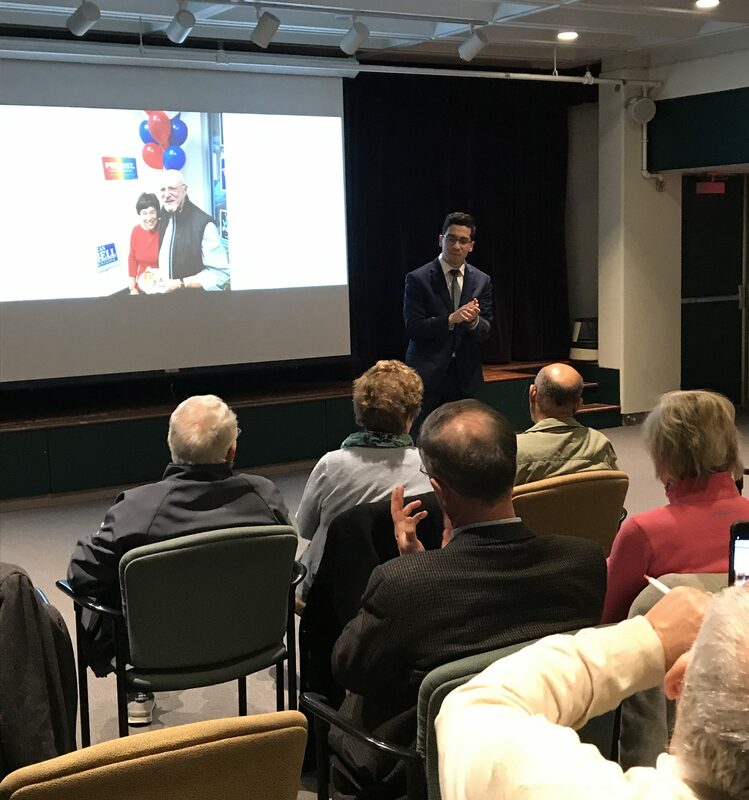 We will also hear from Rory Devlin, the North Shore Coordinator for the MA High School Democrats, and get information on the 2019 Democratic State Convention. Finally, we’ll open it up to everyone as we discuss our three active subcommittees. What are your thoughts about our 2018 activities? What would you like to see in 2019? Don’t miss this great opportunity to share ideas and mingle with fellow Haverhill Democrats as we head into 2019. Looking forward to seeing you on February 4! February 4, 11 a.m. – 1.p.m., Lawrence Paid Family and Medical Leave Listening Session, MassHire Career Center, 255 Essex St., 7 p.m. – 10 p.m.
February 4, 6:30 p.m., HDCC 2019 Kickoff, Haverhill Public Library, Johnson Auditorium. Bring a friend and a snack to share! Chere Bemelmans contributed to this newsletter. 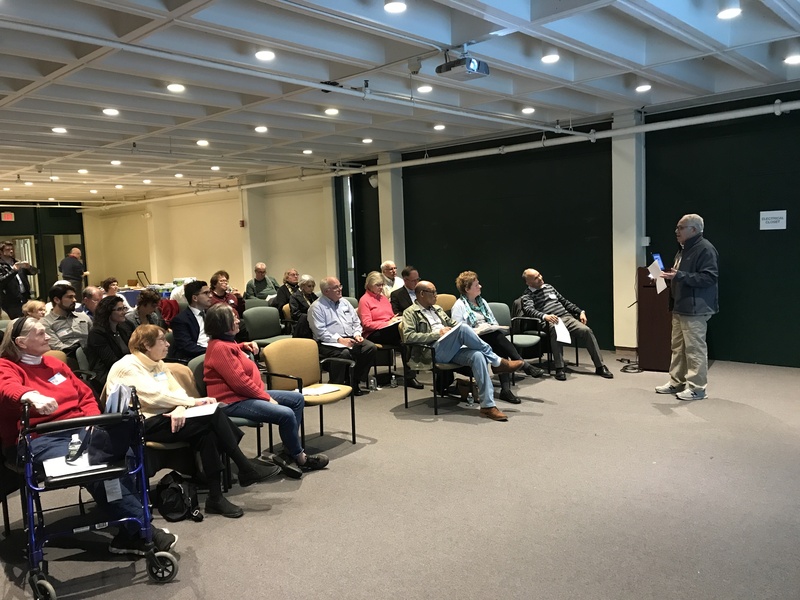 The Haverhill Democratic City Committee (HDCC) presented Ballot Breakdown, a discussion forum on the three ballot questions that will be voted on during the November 6th election. 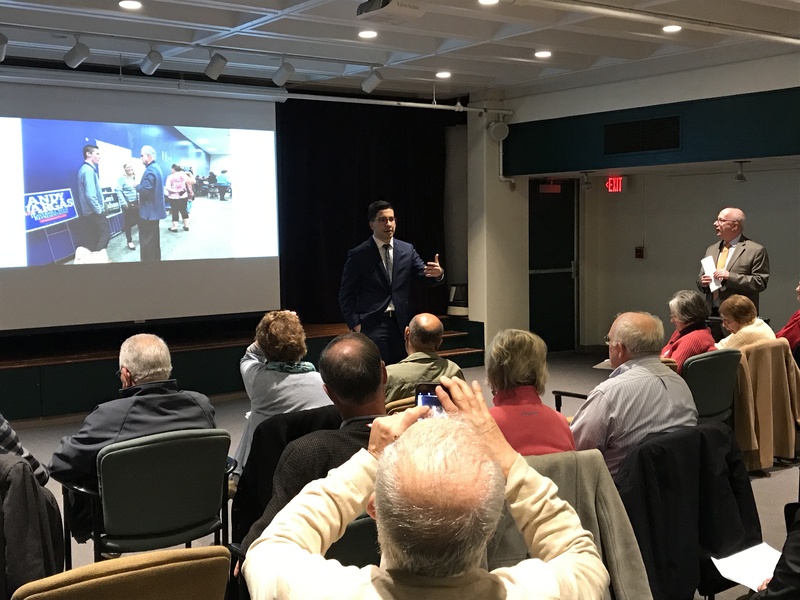 The forum took place at Haverhill’s HC Media Center in Harbor Place. 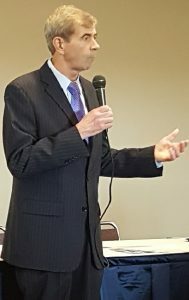 Speakers discussed the Yes and No vote on Question 1, and one speaker each spoke for a Yes vote on Ballot Questions 2 and 3. The Massachusetts Democratic Party has endorsed Yes votes on Ballot Questions 2 and 3. More information on the forum discussion can be found by clicking here. 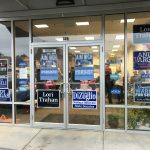 The Haverhill Democratic City Committee officially opened its 2018 campaign headquarters last Sunday night. 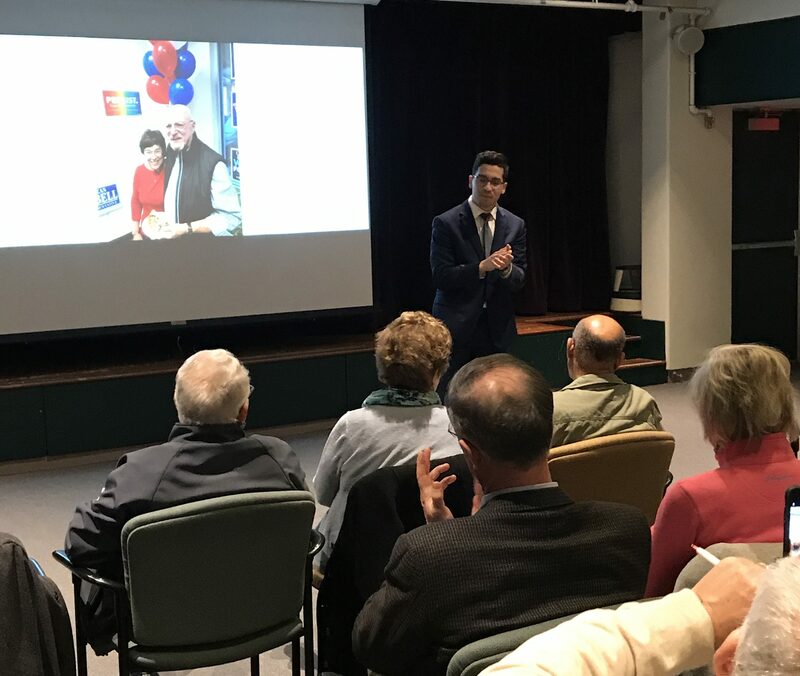 More than 70 people attended the open house, and they were treated to pizza, snacks and one-on-one conversations with many of the local candidates. Attending were candidates John O’Brien, Registrar of Deeds; Diana DiZoglio, State Representative and candidate for State Senate; Quentin Palfrey, candidate for Lieutenant Governor; Andy Vargas, State Representative (unopposed); Christina Minicucci and Christina Eckert, candidates for State Representative; and Lori Trahan, candidate for MA Third Congressional District. All spoke, citing the importance of getting out the vote and making sure we turn the Congress blue this November 6. All stressed the need for volunteers and the importance of canvassing because the best way to increase voter turnout is one-on-one conversations. Other volunteer opportunities include postcard writing, phone banking, talking to friends and neighbors, and helping staff the campaign office. And if you want to volunteer to help with any of the campaigns, all of the links above lead to candidates’ websites; candidates not at the Grand Opening are linked to below. Please sign up and get involved! All of these candidates need your help. Election Day is less than four weeks away, so commit to an hour or two every weekend and help drive the Blue Wave. What do you mean, you don’t vote!!?? We all vote — right? And we know how important voting is. But do you ever run into someone who doesn’t vote? I was canvassing recently, and a young man told me that he and his girlfriend just weren’t going to focus on politics now — they were going to focus on school and getting her small business going. He wasn’t registered; she didn’t vote. Of all people to not vote — students and small business owners — two groups with a huge stake in who’s in charge. Obama said recently, “In the last midterms election, in, fewer than one in five young people voted. One in five. Not two in five, or three in five. One in five. Is it any wonder this Congress doesn’t reflect your values and your priorities? Are you surprised by that?” At the beginning of the 114th Congress, which ran from January 2015 to January 2017, the average age of House members was 57.0 years; of Senators, 61.0 years. You can guess which demographics have the highest voter turnout — right? The bottom line: if you want the government to work for you — not the 1%; not the corporations; not the gas and oil companies — you need to vote. 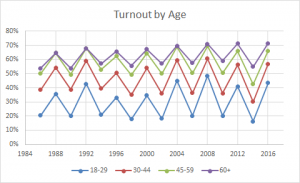 I guarantee that if the bottom and top lines in that graph were switched — if the 18-29 age group were the ones showing the 70% turnout — we’d have a very different government. People say, “I don’t play the politics game, I don’t pay attention to politics” — well, the environment is getting poisoned, families are getting pulled apart and deported, prisons are privatized, real-life Nazis live happily among us, Native Americans are so disenfranchised our country is basically still colonizing them, Puerto Rico has been abandoned, the American education system has been turned into a business, and every day 96 people get shot and killed. You might not be a big fan of politics, but you can still participate. All you need to do is vote for people you believe will work on these issues, and if they don’t work the way they should, then it is your responsibility to call them, organize a town hall and demand that they show up — hold them accountable. Bottom line: VOTE; use the above inspiration to convince those nonvoters in your life to get out there and make a difference. 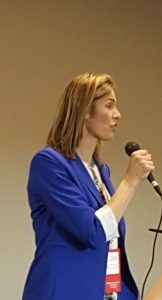 After a vigorous primary campaign among exceptional candidates, the HDCC congratulates Lori Trahan on becoming our candidate for the Third Congressional District! Now we must unite together to support her and get out the vote on November 6th. The HDCC is opening campaign headquarters in the Walgreen’s Plaza on Main Street, across from Kenoza Ave. We need volunteers to help staff the headquarters, so if you’re interested, please contact Peggy Toomey at [email protected] and Roz McKeon at [email protected]. While headquarters is open, we’ll be having committee meetings, canvassing, post carding, and other events there. The headquarters is convenient to Giovanni’s, Walgreens, and an urgent care clinic. 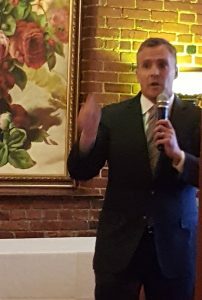 The Haverhill Democratic City Committee held its Unity Event on Sunday, September 16. Candidates Lori Trahan, Dan Koh, and Alexandra Chandler attended, as did Democratic nominee for lieutenant governor Quintin Palfrey; former candidate for governor Bob Massie; Haverhill State Representatives Linda Dean Campbell, Andy Vargas, and State Senate candidate Diana DiZoglio; Governor’s Council candidate Eileen Duff; State Representative candidate Christina Eckert; and John O’Brien, candidate for Register of Deeds. All speakers stressed the need to unite behind our nominees. Bob Massie said that he was dedicating his time and energy to make sure Democrats took back the corner office. 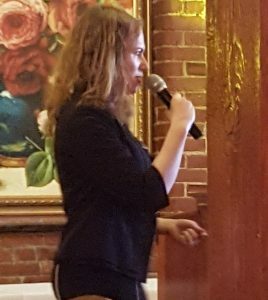 Alexandra Chandler expressed the importance of uniting behind our Congressional nominee, although at the time of the Unity Event, the results of the recount were not known. Speakers also emphasized the need for individual action. Candidates can’t win by themselves – we need to get out there and help them. Speaking on behalf of Senator Elizabeth Warren, Field Organizer Lorenza Ramirez stressed the importance of volunteering. 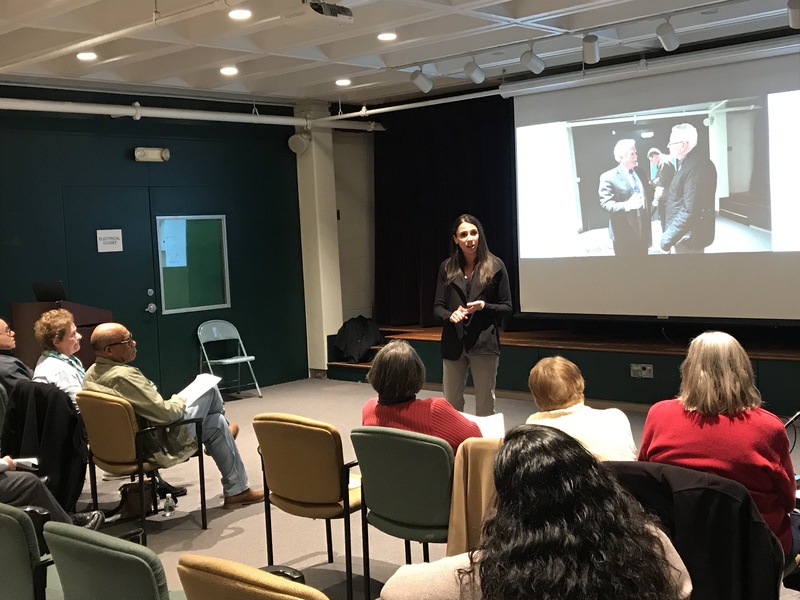 There are 2,000 voters in Haverhill who do not vote in mid-term elections, and the best way to motivate these people to vote is by talking to them one-on-one. She encouraged us all to start knocking on doors! Check out this video that Lorenza’s team made about canvassing. Lorenza said that in her last weekend of canvassing, she talked to many voters who had never heard of Jay Gonzales. We encourage folks to sign up online as soon as they can because 1) we can make sure we have enough literature for all the candidates (a coordinated lit piece is in the works) and 2) the canvasses with the greatest sign-ups before the weekend are the ones most likely where we can get a surrogate to kick it off! Swing Congress is planning a leaf-peeping canvassing event on Saturday, September 29. Come enjoy the fall colors in the Granite State while we get out the vote for our Sister District New Hampshire 1. Look for more details coming soon but mark your calendars now. Please contact Kathy Rurak ([email protected]) for more information about this committee. The Action Committee met at the Barking Dog on Monday, September 17. We discussed staffing the headquarters, which Peg Toomey is organizing. We also talked about ways to get out the vote and how to reach people who just don’t pay attention. We are tentatively planning a brainstorming session about voter engagement at headquarters; stay tuned for more details. Contact Chere Bemelmans for information about the Action committee. The Action Committee meets next on October 15 at 6:30 p.m. at the HDCC Campaign Headquarters (Walgreens Plaza on Main Street across from Kenoza). The committee to Swing Congress is holding postcard events at Panera Bread Saturdays from 2:30 to 4 p.m. at Panera Bread in Plaistow, just over the state line, but is planning to canvass in New Hampshire on September 29. Stay tuned for information about Hubdialer and post carding at headquarters. Please contact Graham Schwass ([email protected]) for more information about Swing Congress. The next HDCC Events Committee will be meeting on Tuesday October 9, 2018, at Roz McKeon’s home at 7 Myles Standish Drive, Haverhill MA 01835 at 6:00. Contact Rosemary Young if you would like to attend. After a successful Unity Event last Sunday, the Events Committee is planning the Ballot Breakdown, which will be held on October 25, 6:30 p.m., at Harbor Place. Ballot Breakdown will feature speakers on both sides of the three ballot questions. Please contact Rosemary Young here for more information. See the Calendar of Events. 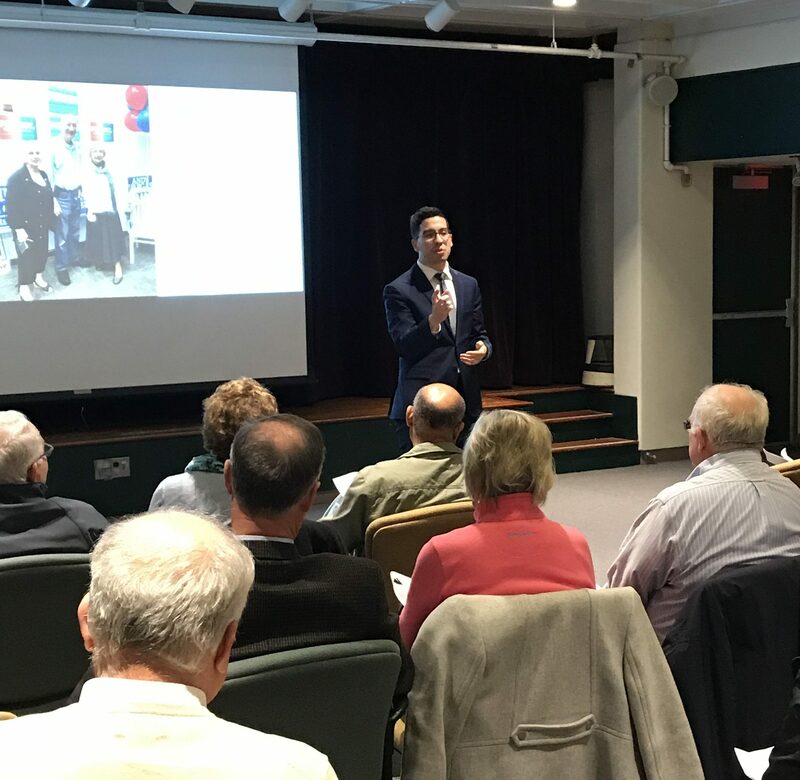 After a busy summer supporting and campaigning for our favorite MA3 candidates, the HDCC is back in full swing planning events to educate, entertain, and enlighten. On September 16, the HDCC will hold a Unity Event at 1 p.m. at the Barking Dog Alehouse. We are inviting all Democratic State and Congressional candidates who ran in the September 4, 2018, Primary to thank them for their hard-fought campaigns and their dedication to public service. We will join in unity to offer our support to all candidates who won their races. They will need our total support to win in the general elections on November 6, 2018. 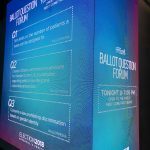 And speaking of elections, are you confused by the 2018 ballot questions? Do you read the descriptions and still ask yourself, “Do I vote yes? Or no?” The HDCC is coming to the rescue — join us for Ballot Breakdown! October 25, 2018, from 6:30 – 8:30 at Harbor Place. We’ll have speakers on both sides of the three ballot questions so you can get information, ask questions, and finally make up your mind. Continuing with the election theme, our own MA3 race is still too close to call! With 84,872 total votes cast, 52 votes separated Lori Trahan and Dan Koh, with Lori Trahan slightly in the lead, the day after the election. Here are the complete Massachusetts election results. Dan Koh collected the correct number of signatures to petition for a recount, so it looks like the recount will start on Monday. Stay up-to-date with the results of this nail-biter by following the HDCC on Twitter and Facebook! 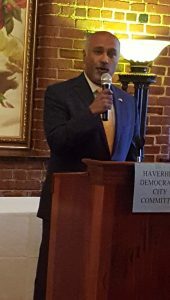 The HDCC held its annual breakfast on August 25. Between 175 and 200 persons attended; 132 voted in the straw poll. Because it was a week and a half before the primary, many candidates attended, spoke, and hung around to chat with breakfast goers. 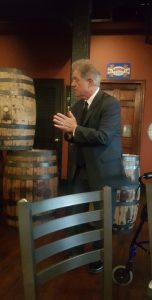 We heard from both Democratic candidates for governor, Jay Gonzales and Bob Massie, and both Democratic candidates for lieutenant governor, Quinten Palfrey and Jimmy Tingle. 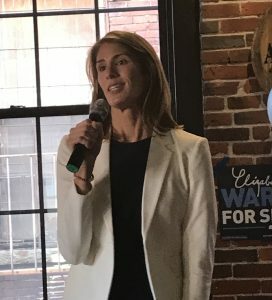 Democratic candidate for secretary of state Bill Galvin and Josh Zakim’s wife Grace also spoke. Haverhill’s state representative delegation Linda Dean Campbell, Andy Vargas and Diana DiZolgio spoke next; they were uncontested in the Democratic primary (Diana DiZoglio is running for State Senate). 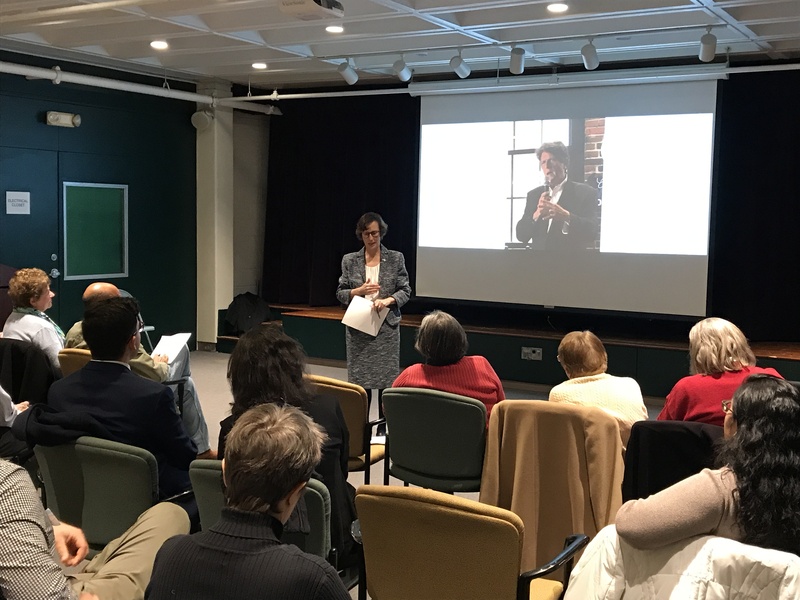 We heard from some new voices: Christina Eckert (Democratic candidate for the 2nd Essex House seat), Lisa Ferry (Democratic candidate for the 14th Essex House seat), and Alice Merkel (Democratic candidate for Register of Deeds). Next, the awards for Distinguished Democrats were given by Bill Cox to Rosemary Young and Kathy Rurak, who received two standing ovations from the breakfast crowd! 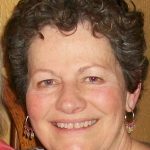 Rosemary Young heads up the Events Committee and has organized meet and greets and forums – she’s hard at work once again organizing the Unity Event and the Ballot Breakdown. Kathy Rurak heads up the Immigration Task Force. 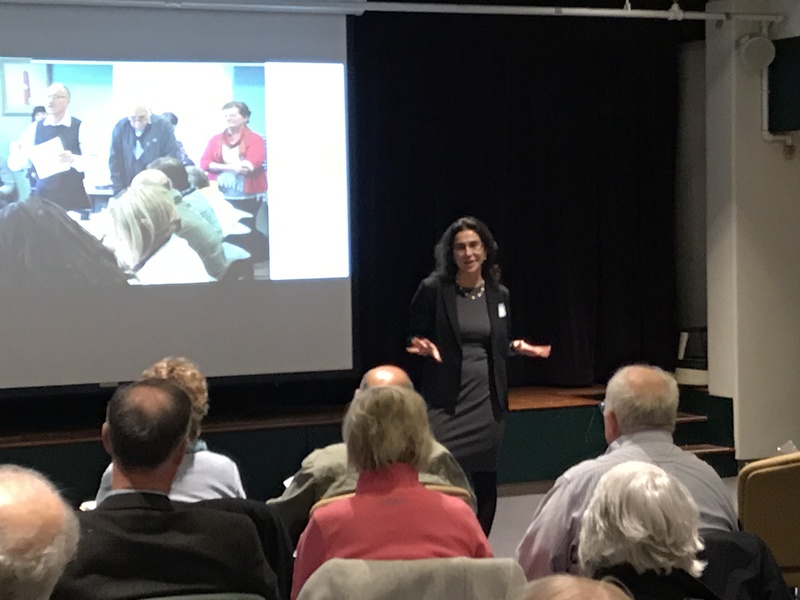 The task force meets monthly, and meetings feature speakers like Juana Matias and Trevor La Fauci. She also keeps us aware of immigration action items and ways that we can all help. Congratulations, Kathy and Rosemary! The HDCC also gave special recognition to Roz McKeon. Roz has headed up the breakfast committee every year, and every year it is a huge success. 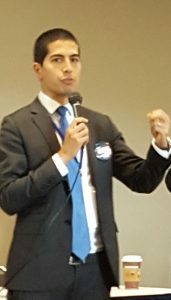 We then heard from the MA3 candidates, in ballot order: Alexandra Chandler, Beej Das, Rufus Gifford, Leonard Golder, Dan Koh, Barbara L’Italien, Juana Matias, and Lori Trahan. Finally, it was time to complete the Straw Poll. For full results, please click here. The HDCC thanks everyone who participated, whether you were a candidate speaking or there for the breakfast and conversation. The Action Committee meets next on September 17 at 6:30 p.m. at the Barking Dog Alehouse. The committee to Swing Congress is holding postcard events at Panera Bread every Saturday from 2:30 to 4 p.m. at Panera Bread in Plaistow, just over the state line. Stay tuned for information about Hubdialer parties. Please contact Graham Schwass ([email protected]) for more information about Swing Congress and Chere Bemelmans ([email protected]) for information about the Action committee. The Events Committee is back in full planning mode. The Unity Event and Ballot Breakdown are two upcoming events. Please contact Rosemary Young here for more information. The HDCC’s Annual Breakfast is coming up fast – August 25, 10 a.m., Maria’s Family Restaurant Galleria Banquet Room (85 Essex St.). If you don’t have your tickets yet, you can print the form here. If you haven’t been to an HDCC Annual Breakfast, you’re in for a treat. Where else can you hobnob with Democratic candidates up and down the ballot? (I once had a long conversation with Martha Coakley as I waited for my mother to come out of the bathroom.) If you’re feeling overwhelmed by the state of the country, what better place to get inspired and fired up and ready to go? If you’re already fired up, you’re in the right place! This year we’re in for a treat: the amazing candidates running for the Third Congressional District will be at the Breakfast! If you haven’t had a chance to meet these wonderful candidates or hear them speak, don’t miss this Breakfast. We will also hear from other candidates for state and local races. Remember: the primary is on September 4! A highlight of the Breakfast is honoring our Distinguished Democrats. This year the HDCC is recognizing Rosemary Young (left) and Kathy Rurak (right). Rosemary Young heads up the Events Committee. 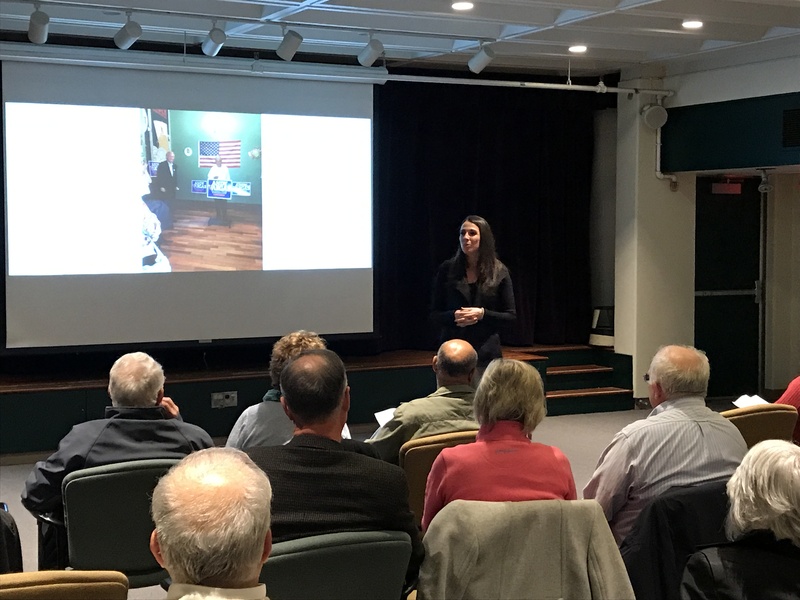 She has organized meet and greets and forums with Sheriff Coppinger and Eileen Duff on gerrymandering, and on the opioid crisis. Kathy Rurak heads up the Immigration Task Force. 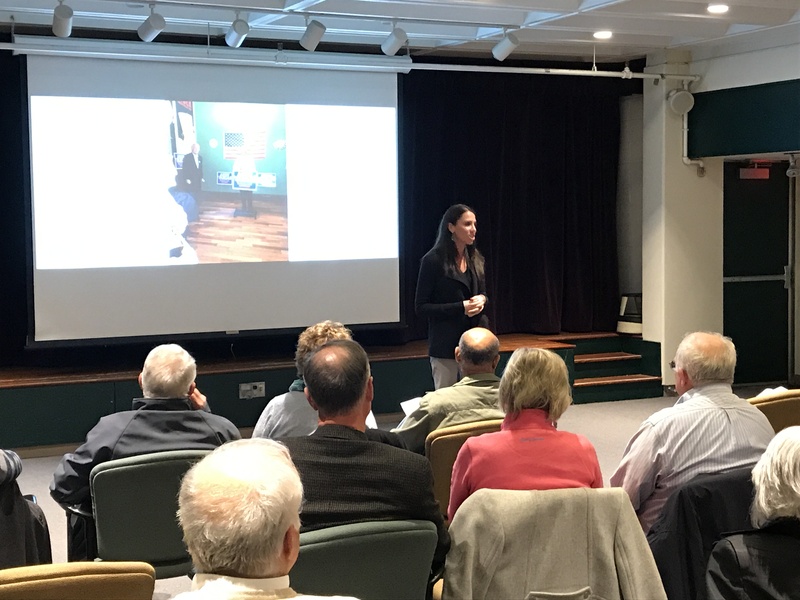 The task force meets monthly, and meetings feature speakers like Juana Matias and Trevor La Fauci. 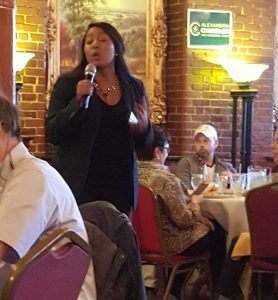 She also keeps us aware of immigration action items and ways that we can all help. So come to the breakfast to say “thank you” to these awesome committee leaders! See past Distinguished Democrats here. Another highlight of the Breakfast is the straw poll. Don’t miss the chance to cast your vote for your favorite candidates! So come for the bacon, the balloons, or the Democrats – see you at the Breakfast! Join Swing Congress every Saturday at Panera, just across the line in Plaistow, from 2:30 to 4 p.m. So come to get out of the heat, enjoy an iced coffee and, unleash your creativity writing to your fellow Democrats. Contact [email protected] for more information and look for email announcements of more Swing Congress events. The Immigration Task Force is on summer break. Please contact Kathy Rurak ([email protected]) for more information about this committee. The Action Committee meets next on August 20 at 6:30 p.m. in the Milhendler Room, Haverhill Public Library. The committee to Swing Congress is holding postcard events at Panera Bread every Saturday from 2:30 to 4 p.m. at Panera Bread in Plaistow, just over the state line. Stay tuned for information about Hubdialer parties. Please contact Gtraham Schwass ([email protected]) for more information about Swing Congress and Chere Bemelmans ([email protected]) for information about the Action committee. The Events Committee is on summer break. Please contact Rosemary Young here for more information. 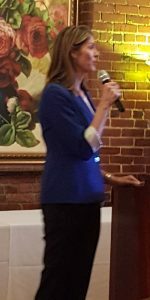 The Haverhill Democratic City Committee Annual Breakfast will be held on Saturday, August 25, 2018, at 10 AM, at Maria’s Family Restaurant, Galleria Banquet Room, 85 Essex Street, Haverhill. Candidates for the 3rd Congressional Seat, along with Democratic candidates for Governor, Lt. Governor, Secretary of State, and other statewide offices will be attending. 2018 Distinguished Democrats will be awarded and straw poll will be conducted on all contested races. You may have read that Trump’s Supreme Court pick, Brett Kavanaugh, is a great guy in a carpool — a great friend. You may have also read that he’s an influential judge and a loyal friend. Should we be worried? Yes! First, Kavanaugh was vetted and approved by the Heritage Foundation, a conservative body that approves judges who rule favorably for big business and against women’s right to choose. He is likely to rule to overturn Obamacare and the clause that protects preexisting conditions. Perhaps most consequential, he has written that he does not think that sitting presidents should be subject to lawsuits and criminal investigations. With the confirmation of Kavanaugh, the Supreme Court will have a conservative slant for years to come. Many of the rights and freedoms held dearly by Democrats — universal health care, net neutrality, gun control, a woman’s right to choose, racial and gender equality — could be at risk. And the deck will be even more decidedly stacked toward corporations for decades. If you have five minutes (or a little more time for some), you can do something to fight back. Please see our action items this week. H4671 An Act automatically registering eligible voters and enhancing safeguards against fraud, passed the Massachusetts Senate unanimously. About 8 HDCC members gathered on Saturday, June 9, at Panera Bread in Plaistow to flip the Congress (and other races as well) blue. 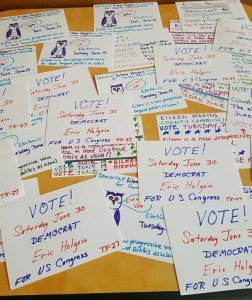 Yesterday we wrote postcards for Eric Holguin, Democrat running for Congress in Texas, and Eileen Higgins, running for County Commissioner in Florida. Besides writing and decorating many postcards, we enjoyed conversation and Panera’s great pastries and coffee. This is a great way to meet fellow HDCC members and have an impact on important national races. 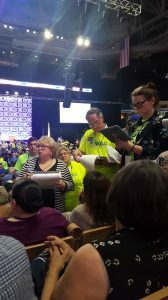 On June 1-2, Haverhill sent representatives to the Democratic State Convention. This year the convention endorsed three state candidates — governor, lieutenant governor, and secretary of state. 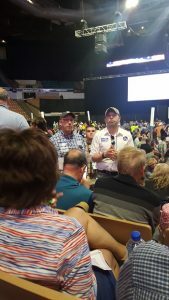 The convention opened on Friday, June 1, when the four candidates who do not have primary challengers addressed the convention: state Auditor Suzanne Bump, state Treasurer Deborah Goldberg, Attorney General Maura Healey and U.S. Senator Elizabeth Warren. But the main work of the convention — endorsing candidates with primary challengers — happened on Saturday. The day started with sponsored breakfasts; this year, the MTA, SEIU, and Voter Choice Massachusetts held breakfasts. We went to the Voter Choice breakfast and were treated to pastries and talks by all the major candidates. As we munched chocolate croissants, Josh Zakim, Bill Galvin, Jay Gonzales, Lori Trahan, Alexandra Chandler, Dan Koh, Quentin Palfrey,and Barbara L’Italien stopped by to speak about their candidacies and the importance of voter choice. The convention itself kicked off with a rousing speech by Ed Markey. After the roll call, we heard the candidates speak: first governor — Bob Massie and Jay Gonzales; then lieutenant governor — Quentin Palfrey and Jimmy Tingle; and finally secretary of state — Bill Galvin and Josh Zakim. 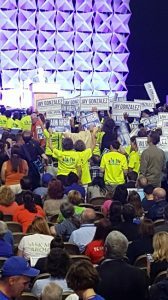 As each candidate spoke, supporters in candidate tee-shirts with signs gathered at the front, near the stage. After the speeches, the roll was called again and we voted. 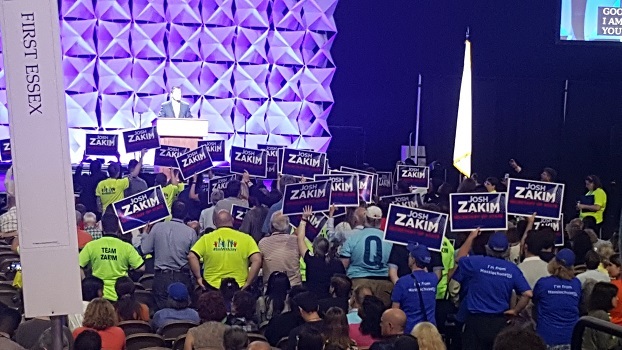 There was a major upset: newcomer Josh Zakim upset incumbent William Galvin for the secretary of state endorsement with 55% of the vote. 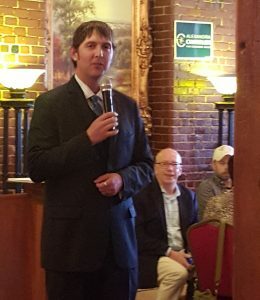 The convention also strongly endorsed Jay Gonzales for governor, with 70% of the vote, to Bob Massie’s 30%. 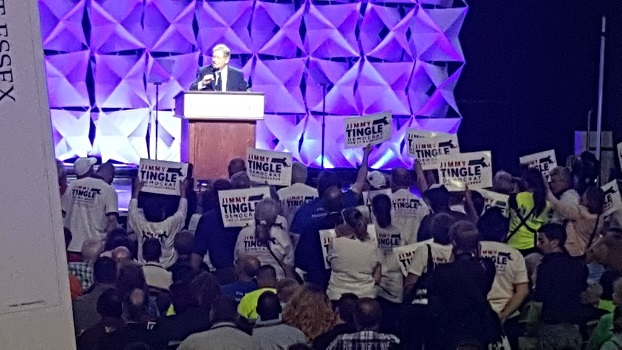 Quentin Palfrey won the convention’s lieutenant governor’s endorsement with 59% of the vote to Jimmy Tingle’s 41%. 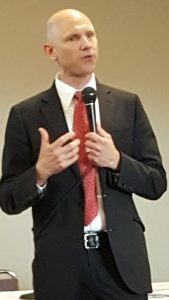 Although Jay Gonzales, Quentin Palfrey, and Josh Zakim won their party’s endorsement, Bob Massie, Jimmy Tingle, and William Galvin will all appear on the ballot, having achieved more than 15% of the vote. Don’t forget to follow the HDCC on Twitter! The newsletter is taking a brief summer break (we’ll be back in mid-July), and Twitter is a way to keep in touch. And be sure to re-tweet HDCC Tweets! The Immigration Task Force meets next on June 18 at 5:30 in the Johnson Auditorium, Haverhill Public Library. Note new location! Please contact Kathy Rurak ([email protected]) for more information about this committee. The Action Committee meets next on June 18 at 7 p.m. in the Milhendler Room, Haverhill Public Library. Note new time! The committee to Swing Congress is holding postcard events at Panera Bread; stay tuned for the next event as well as Hubdialer parties. Please contact Gtraham Schwass ([email protected]) for more information about Swing Congress and Chere Bemelmans ([email protected]) for information about the Action committee. The Events Committee is taking a break in June! Please stay tuned for the next meeting information. Please contact Rosemary Young ([email protected]) for more information. 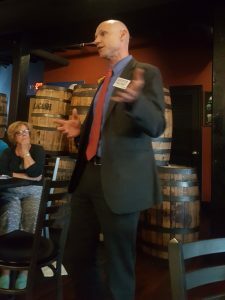 The HDCC held its second Meet and Greet Wednesday, May 23, at the Barking Dog. 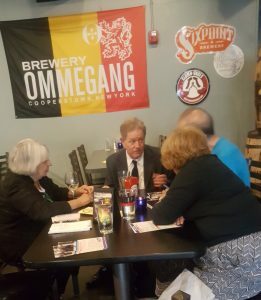 We had a chance to talk one-on-one with candidates for lieutenant governor Quentin Palfrey and Jimmy Tingle. 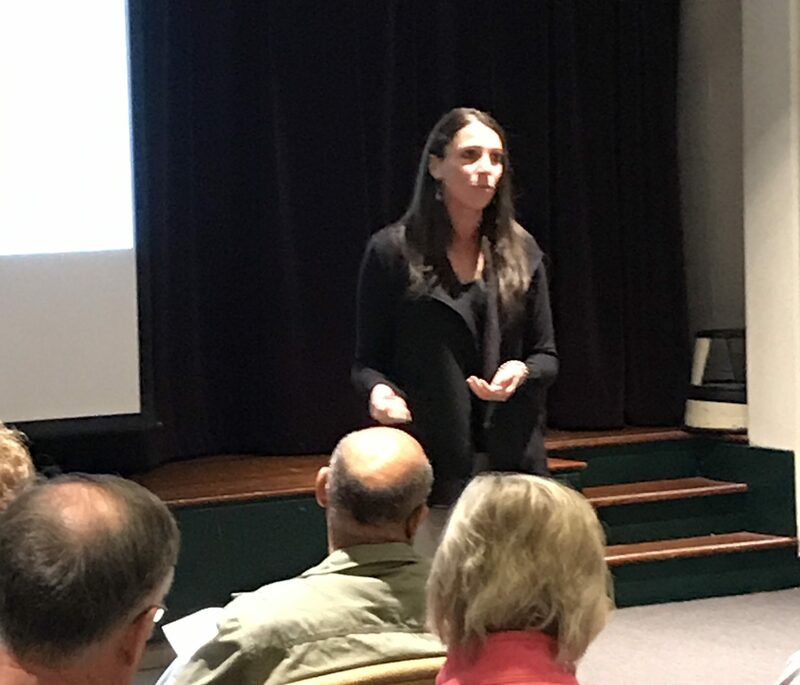 A representatives from Josh Zakim’s secretary of state campaign, Grace Zakim, also spoke. 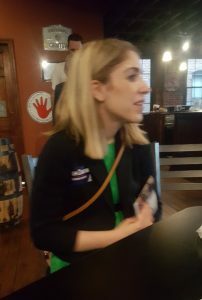 Josh Zakim had another commitment and could not attend, and William Galvin, the incumbent, was held up at the state house and also could not attend. Grace Zakim spoke on behalf of her husband Josh, who is a candidate for secretary of state. Josh Zakim believes strongly in increasing access to voting: same day voter registration, early voting, and automatic voter registration. 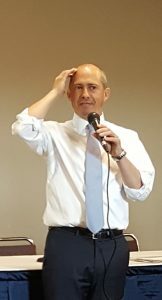 He believes that Massachusetts should be a leader in voting; instead, the state gets a C rating. Besides hearing the candidates’ and representative’s presentations, we had ample opportunity to sit down and speak with each candidate one on one, which was definitely the most rewarding part of the evening. Kudos to the Events Committee for another great Meet and Greet! 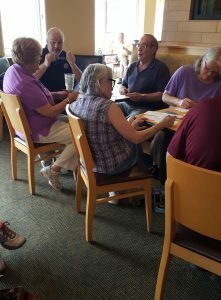 Swing Congress held its first postcard-writing event on Saturday, May 26, at Panera in Plaistow. Eight persons gathered to write postcards on behalf of Genevieve Jones-Wright, candidate for District Attorney in San Diego. 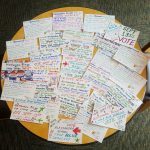 With multicolored sharpies and pre-addressed postcards provided by Postcards to Voters, we let our creativity run wild as we encouraged voters a continent away to vote on June 5. The next postcard event will be on June 9 at 2:30, Panera in Plaistow. (Clockwise from far left, Ron Peacetree, Graham Schwass, Jean Longfellow, Jean Sanders, and Penelope Davis. We’d like to hear what you think, so we’ve created a webpage just for you and your thoughts. Introducing Guest Posts — a chance for HDCC members to sound off about issues important to you. Posts will stay up for two weeks before being archived. Please email Guest Posts to [email protected]. Here’s an article from The New Yorker for your Memorial Day reading pleasure: In the Trump Era, We Are Losing the Ability to Distinguish Reality from Vacuum. The Immigration Task Force has been focusing on the passage of the Safe Communities Act. Things happened quickly after our Monday (May 21) meeting but thanks to everyone that was able to get in a call to Senators. Now it will go to the House. I will be talking to several people in MIRA, Rep. Matias office, and Sen. Warren’s office this week to get a sense of where this might go in the House and what we should try and do. Thanks again to everyone who attended on Monday. A good meeting with important new ways we might reach our elected officials. Please contact Kathy Rurak ([email protected]) for more information about this committee. 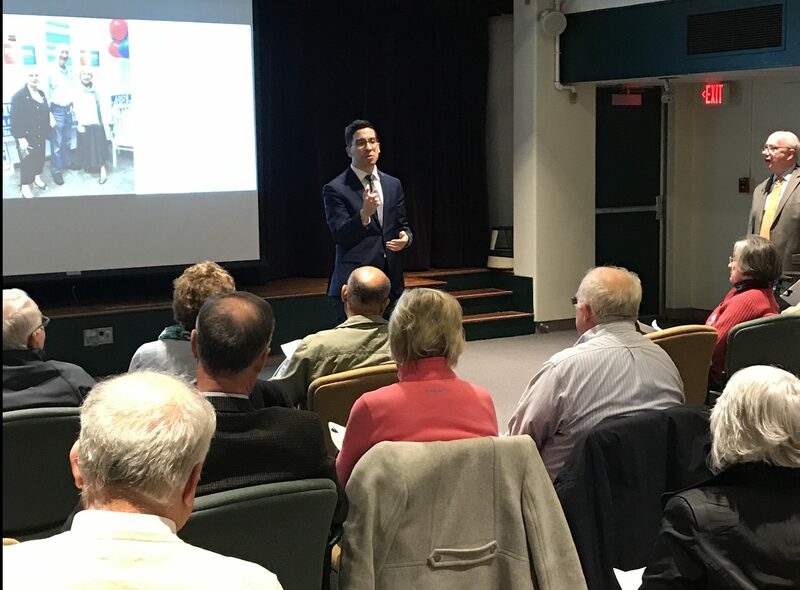 The Action Committee met on May 21 at the Haverhill Public Library. 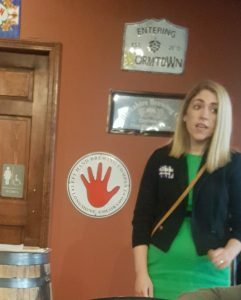 Victoria Nader, from the Josh Zakim for Secretary of State campaign, gave a short talk on his candidacy. The Voter Registration sub-committee reported on plans to register voters throughout the summer. The committee to Swing Congress has been meeting on Fridays at the Artist’s Cafe to plan post carding and Hub dialing events to contact voters across the nation to unseat Republican members of the US House and Senate. We had our first Post Carding event on Saturday at Panera’s in Plaistow. We had 8 people who turned out over 60 postcards for a race for District Attorney in San Diego, California. Our next postcarding event will be on Saturday, June 9, from 230p – 4p, at Panera’s in Plaistow. Come join us – lots of political discussion (and lots of fun too!). Please contact Gtraham Schwass ([email protected]) for more information about Swing Congress and Chere Bemelmans ([email protected]) for information about the Action committee. The Events Committee meets monthly and plans HDCC meet and greets and other informative events. Please contact Rosemary Young ([email protected]) for more information. 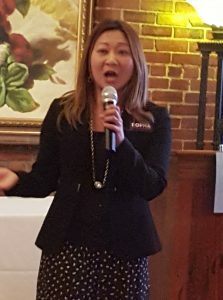 Koh says that the American Dream is under attack, and L’Italien highlighted her work on Hunking School, the Rail Trail, and advocating for people with autism. Littlefield is running to improve the lives of working- and middle-class Americans, and Malone praised her parents, teachers, and mentors who helped her achieve the American Dream and says it is out of reach for many. Matias talked about growing up in Haverhill and says that there’s too much at stake to sit back: the president does not believe her story makes America great. 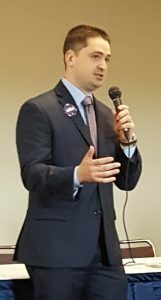 A newcomer to the race, St. John advocates for environmentally friendly jobs. Trahan will fight for working families — too many are struggling for a shot at the American Dream. It was enlightening to hear these intelligent, committed candidates speak about what drives them to run for office. It was exciting to be able to ask follow-up questions and have conversations with them. We are truly fortunate here in the Third District to have an amazing group of candidates running for Tsongas’ seat. If you want to know more about these candidates, please follow the links above to their websites. Once you’ve got a favorite, donate some time or money to help him or her get elected!